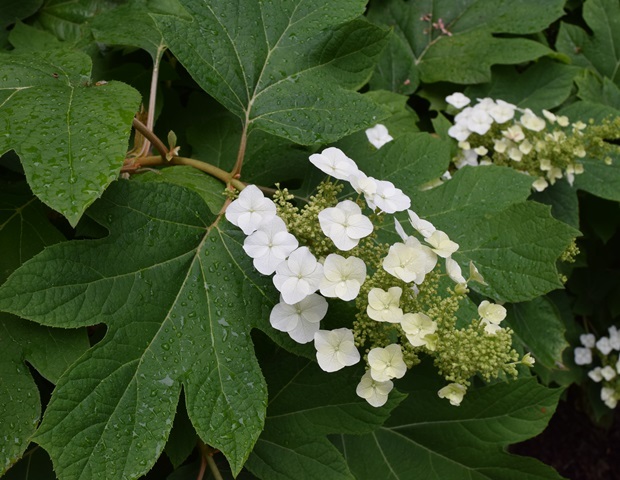 Native to bluffs, moist woods, ravines, and stream banks in the southeastern U.S., oakleaf hydrangea (Hydrangea quercifolia) is a broad, rounded, deciduous shrub growing up to seven feet tall and eight feet wide. It is named for its beautiful, large, deeply lobed oak-like leaves. Cone-shaped clusters of white florets, up to a foot long, are held above the foliage in early summer and turn pink, lavender, bronze, and then brown as the season progresses. The showy but sterile florets surround tight clusters of small greenish-yellow true flowers hidden underneath. In fall, the leaf color varies from crimson red to a mix of wine, purple, maroon, red, and brown. Oakleaf hydrangea performs best in moist, well-drained, humus-rich acidic soil in full sun to partial shade. In the Arb: A wonderful specimen can be found by the trail on the north side of the upper pond in the Woodland Garden. ← Arboretum Receives Nearly $30,000 During GiveBIG!